Like any expectant parents, Almarie and her husband were incredibly excited about their baby’s 20-week anatomy scan that would reveal whether they were having a boy or girl. This was their second child, and they couldn’t wait to see if their son was going to have a baby sister or brother. The same day that Almarie and her husband learned they were having a baby boy, they were also told that he had a birth defect known as spina bifida. The doctor explained that the baby’s back hadn’t developed properly—there was an opening that was exposing his spinal cord and the nerves around it. There is no cure for spina bifida, and children who are diagnosed with it can face many disabilities. Thankfully, Almarie and her husband were referred to Texas Children’s Hospital to help their unborn son, Abdiel. Having surgery to repair Abdiel’s birth defect in utero at Texas Children’s was the most promising option. That’s because an operation before birth offered him a chance to avoid paralysis, brain damage, the need for shunts, and other serious complications. 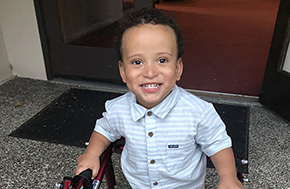 In short, Texas Children’s was able to offer Abdiel the chance for a better, more normal life—before he was even born. “We chose to come to Texas from our home in California for the surgery because we believed Texas Children’s was the very best place for Abdiel,” Almarie explains.